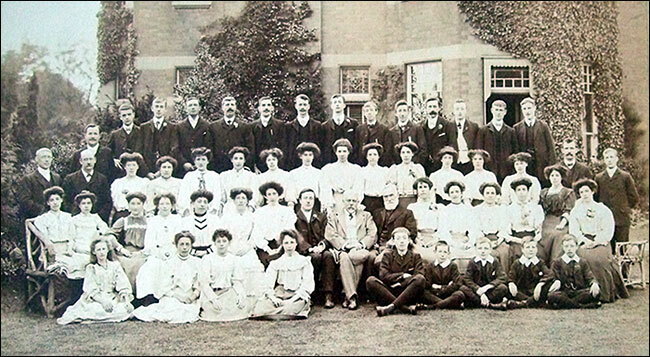 Cave's Choir - this picture came to us in 2018, with a caption telling us it was taken outside The Shrubbery, home of Paul Cave (centre front), Mr Fairey, organist (to his left) and William Skinner, choir conductor (right). A very successful first appearance was made by Messrs. Cave and Sons’ factory choir at the B.W.T.A. Hall, Rushden, on Saturday evening. Mr. T. Surridge presided over a crowded audience, and was supported by Mr. Paul Cave and others. The Chairman explained that the concert was one of a series of gatherings arranged in connection with the B.W.T.A., and said he was pleased to see such a large audience on that first public appearance of the factory choir. Mr. Paul Cave, the choir president, was taking great interest in that organisation, and had fitted up for them a good room at the factory. Mr. W. Skinner was their conductor, and the choir had entered for the contest at Northampton in May. An excellent programme was provided and the choir acquitted themselves in a manner which reflected the greatest credit on their able and painstaking conductor. The following items were included:- Sing ye Jehovah’s praises, choir; solo, The holy friar, Mr. Skinner; The storm-king’s voice, choir; solo, Flight of ages, Mr. Knight; bone sole, Mr. Maurice Keys; Merrily glides the boat, choir; recitation, Sally Salter, Miss L. Baker; solo, Dear home songs, Mrs. Hodgskins; test piece, Awake, sweet love choir; solo, Join our merry, merry throng this day, choir; solo, Queen of the earth, Mr. M. Keys; When the wind blows, choir; solo, Three for Jack, Mr. George Farey; solo, The old wooden rocker, Violet Groome; test piece, Come live with me, choir; solo, Down the vale, Mr. Knight; quartets, The soldier’s farewell, Messrs. Swingler, Sanders, Noble, and Tye; Gently evening bendeth, choir.